The issue opens with another theme song. The kids are about to pick sides, for dodgeball. The team captains are Captain America and Cyclops. 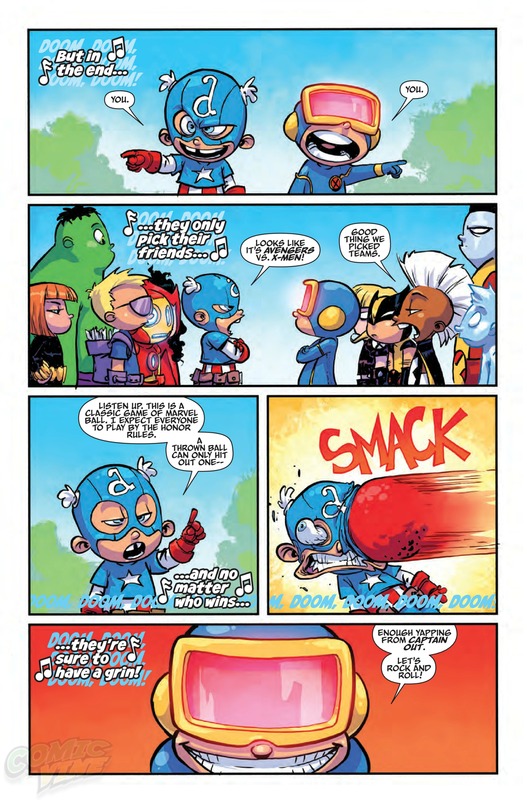 Cyclops keeps the eye puns going but Cap gets to choose first. Once the sides are chosen, Cap announces that it looks like it will be Avengers v X-Men. I love Storm’s sarcastic comment about how picking players was pointless. Captain America is taken out first, and cheaply. 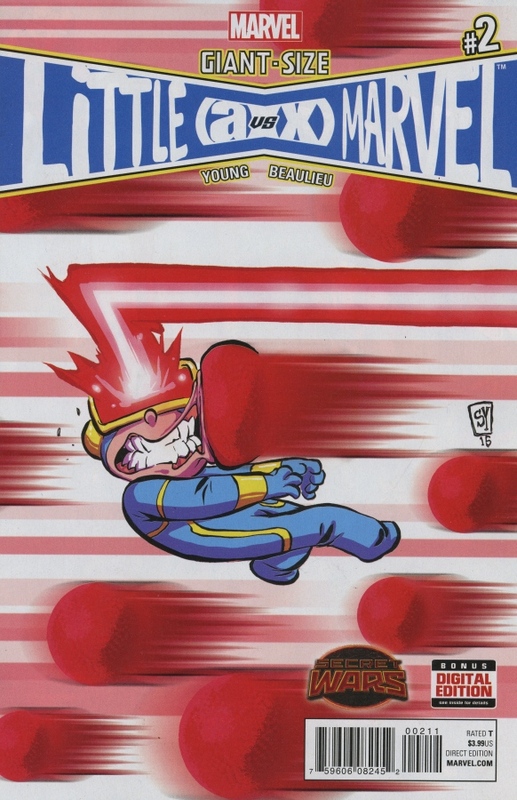 Iron Man tries to gets Cyclops out, but he optic blasts the ball away. Hawkeye throws a dodgeball arrow, and they smashes his visor and Cyclops starts blasting dudes. Iceman, seeing that non-regulation dodgeballs are allowed, starts making ice-dodgeballs. The first one sends Hawkeye througha wall. Now that the rules have been broken, Black Widow declares it is war, now. I like how the rivalry of Magik and Iron Man, is continued. Colossus is throwing balls at Captain America, and one of those ricochets back to Iceman’s face. Hulk gets five balls, successfully, thrown at him. I’m not quite sure where Rogue is throwing a ball towards. The recess bell rings and Colossus is laid out. I adore that the Daredevil is blind running gag continues. Colossus threatens to deal with Captain America, after school. Xavier, their teacher, introduces the new students, the twins. The twins’ names are – Zachary & Zoe, which I don’t believe are known characters. The students get to ask a few questions. Cyclops wants to know if they are mutants, they are not. Captain America asks if they have ever been lost in time, but they are not. Spider-Man asks if they have ever been bitten by an insect or animal, they have not. Arcade gets a ‘yes’ out of them, as they do enjoy playing video games BUT they are not interested in playing a game titled, Murderworld. Which makes sense. The final bell rings, and Xavier reminds them of their homework – five pages on the Kree-Skrull War, also this is Friday so the rest of the series could take place over the weekend. 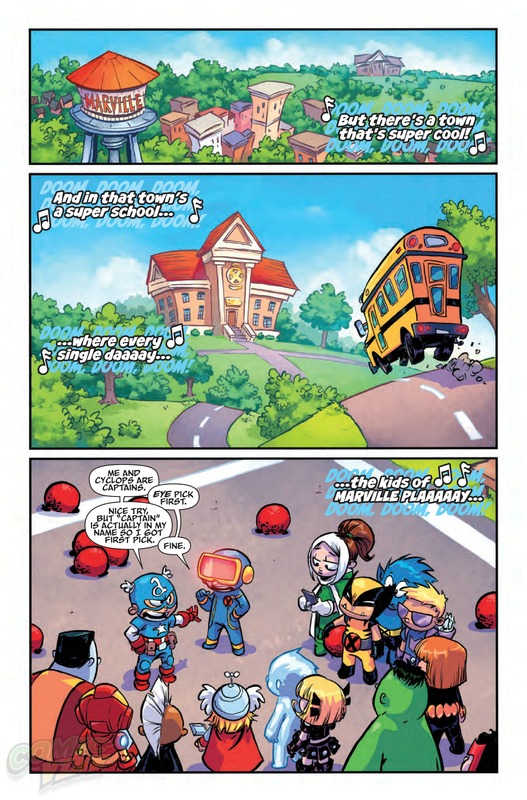 I like that we get to see that the villains go to this school too, but the ‘heroes’ are so distracted with each other. 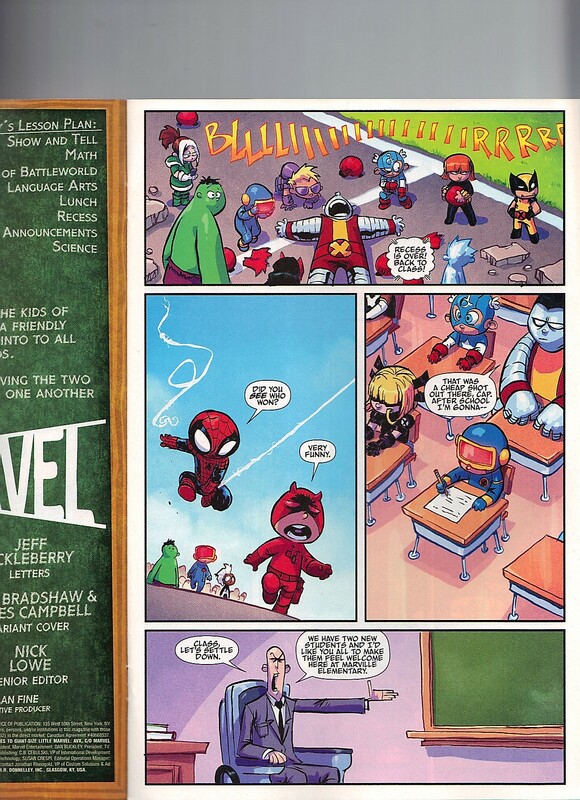 Cyclops and Iron Man, both, invite the twins to their respected secret clubhouses. 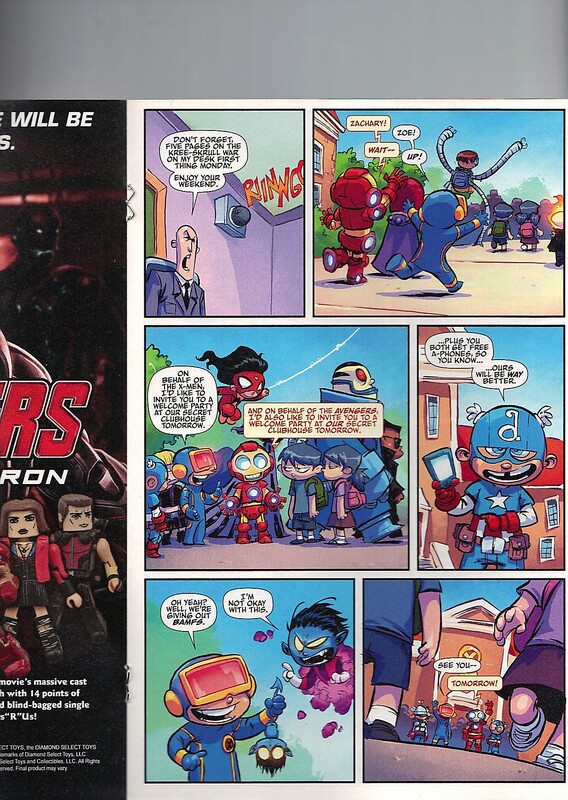 Captain America tries to entice them with free A-Phones. Cyclops offers Bamfs, but Nightcrawler objects to this. Later. Venom goes home, Doctor Strange goes home. Ghost Rider tells his parents that Xavier told him to not exact vengeance, during social studies. Beast’s mother wants him to take a bath but he’s too busy trying to ruin interdimensional space. Namor is feeding his pet fish. Uatu the Watcher would like his father to quit watching him, as he sleeps – which is my favorite of these gags. The Next Day. The X-Men and Avengers Secret Clubhouses are about ten feet from each other, both up in trees. Cyclops is having Storm and Rogue put out a Welcome banner. 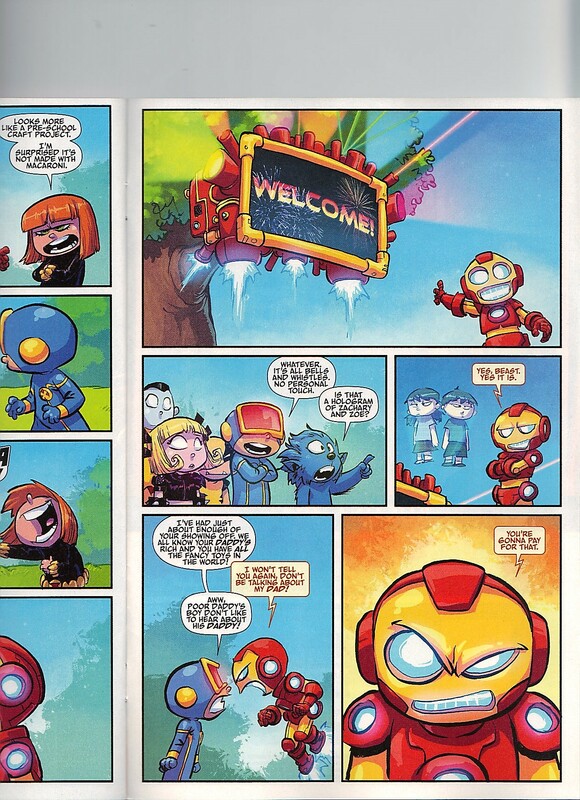 Iron Man and Black Widow make fun of the pre-school craft project. Black Widow goes as far as to say that she is surprised that macaroni wasn’t used. Just then, the terrible Colossus, shows up with craft supplies – including macaroni, which embarrasses Cyclops. Iron Man shows off the Avengers fancy Welcome screen. Cyclops goes for a low blow and attacks Iron Man’s father for being rich and that’s why the Avengers can afford all of these bells and whistles. Zachary and Zoe, having different directions, realize that they are heading in the same location. There is a giant explosion and they look over the hill to see what is happening. Which is a giant battle, with explosions all around. 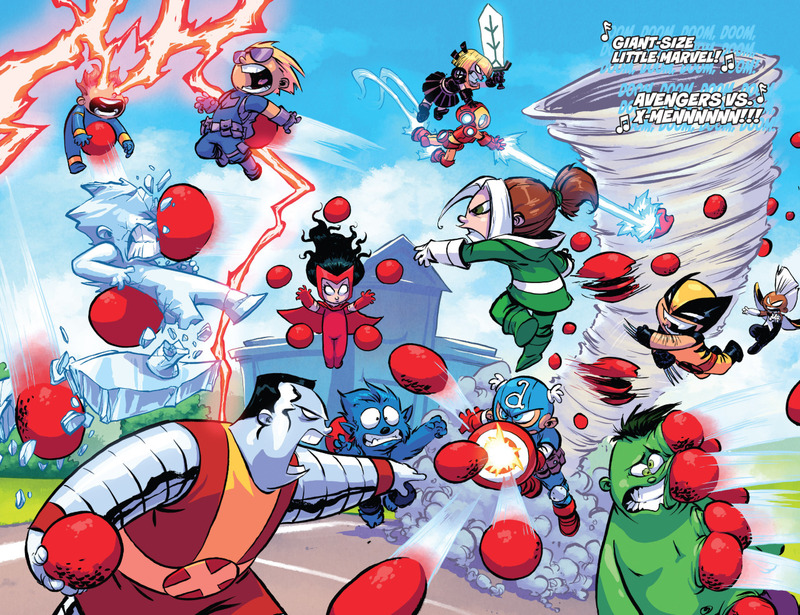 Cyclops and Iron Man are fighting each other, Angel is flying after Falcon. Issue ends with Wanda taking out Cable. The third issue cover has a fight cloud and we see Illyana’s soulsword so I will be buying that issue – for sure.